Simple tower defense games made with Adobe Flash have always been a great way to relax and pass some time. These simple games help to pass the little spare time we have when we are busy with other things. Developed by Trendy Entertainment, Dungeon Defenders II is the successor of Dungeon Defenders, combining the genres of tower defense and action RPG. 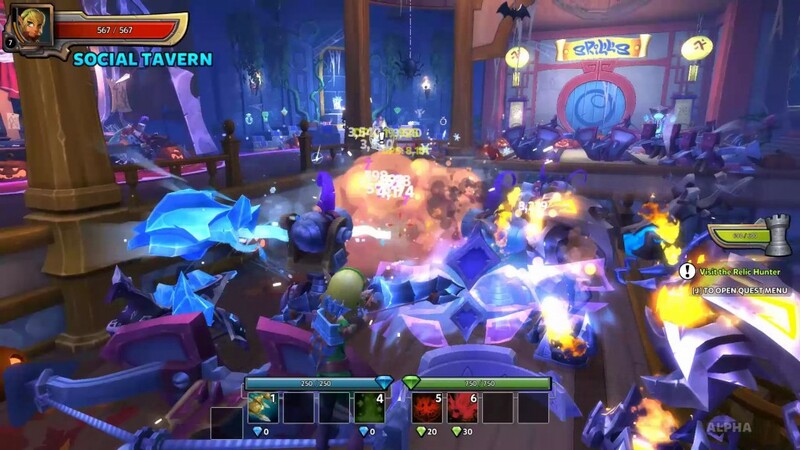 In Dungeon Defenders II, tower defense may not be as simple as you are used to. 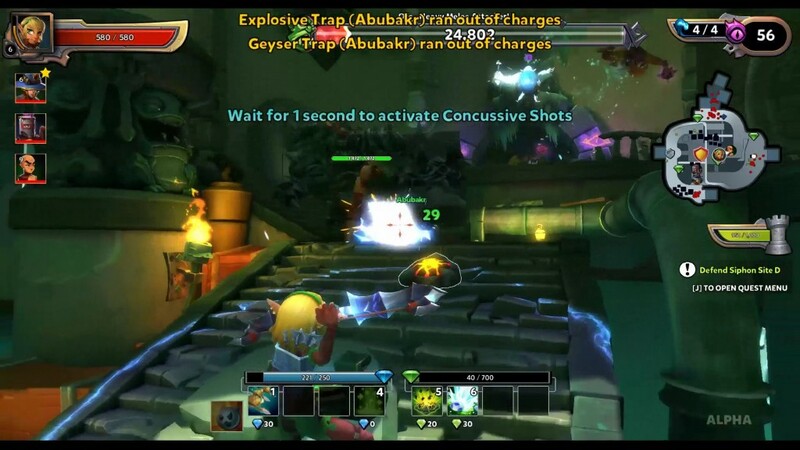 Read on for my first impressions on the Dungeon Defenders II Alpha. Unlike the first game in the series, Dungeon Defenders II is a free to play game. The first game bombarded players with DLC, forcing them to purchase them all if they wanted to keep up. It is never fun to always have to pull out your wallet whenever new content is released. Dungeon Defenders II gives players the freedom to pay when they want and play for free when they want. While equipment will not change the appearance of your character, players can purchase cosmetic items to create their own unique look. From what I have seen in the alpha, the cash shop does not provide any advantages over free to play players. If it remains this way, I will be very happy with Dungeon Defender II’s new model. Now players can open their wallets when they are capable of doing so and not have to worry about missing out on any major content. It’s great to see the game being free and available to all but, fans of the series are no doubt concerned about if this will impact the overall quality. Fortunately, the sequel lives up to the first game, especially when played with friends. The game revolves around four playable classes: the squire, apprentice, huntress, and monk. Each of these classes have their own unique skills, turrets, and/or traps in their arsenal that must all be employed to overcome the increasingly difficult waves of enemies. By employing each classes’ strengths, every map can be secured with the appropriate use of towers, traps, and barricades. To add on to the recommended team play, various skills can be used in conjunction with the other classes. I personally stuck with the huntress for the majority of my play time. This class features a water trap which launches enemies into the air, soaking them with water. As we all know, being soaked in water causes you to take additional damage from electrical attacks (or as the engineers should know, it’s not the water but what is in the water which makes it conductive). My huntress was equipped with a lightning bow causing me to deal additional damage on my own but these traps coupled with the monk’s electrical traps can deal massive damage. By cooperating with your team (or solo), you must defend the main core on various maps. While every map has a unique design and layout, the general gameplay is very similar. Most maps consist of several waves (3-5 on average) which increase in difficulty and conclude with a boss at the end. In between each wave, every player is given some time to setup their defenses. In order to put down any structure or traps, you must have enough green gems. These gems are dropped by enemies or they can be gained by opening the free chests found around the map. After everyone is happy with their setup or once the timer expires, waves of enemy begin to appear. There are many types of enemies with different attacks including melee, ranged, and even flying. As these enemies walk through the multiple lanes, they may be faced with ‘sub cores’ which are additional defenses that are already part of the map. While it is nice to keep these alive, they can be used just as a way of delaying the enemies from getting to your main core. Overall, the maps are well designed and give a lot of options for players to setup their defenses and get around. You are not forced to walk through the predetermined paths; you can jump around and get to where you need. Upon death, enemies can also drop various items. There are A LOT of items to please the collectors. It can be quite overwhelming having to go over dozens of items after each map to see if you found something better to equip. I, along with another friend, did not find the inventory to be as user friendly as we are used to from other games. It can be easy to become overwhelmed and lose track of your items. It would be nice to see additional sorting and searching functionality in the future. Aside from farming and equipping new items, players can also level up to increase their stats and learn new skills. Not all skills are available from level one and therefore it is essential to level up and build up your arsenal. Some equipment also requires higher levels to equip and you cannot hope to clear all the maps at a low level. 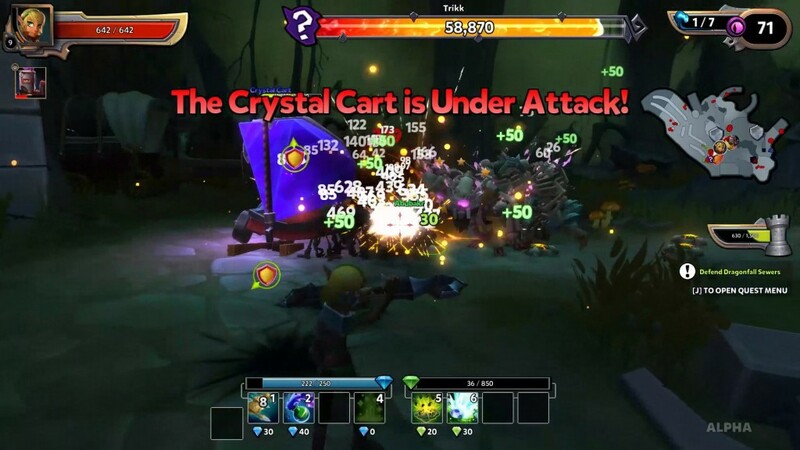 The equipment and leveling aspects make up the RPG portion of Dungeon Defenders II. I can see a lot of time being spent on building your characters and working to reach their full potential. Once you are done clearing a map, you will find yourself in the central tavern. 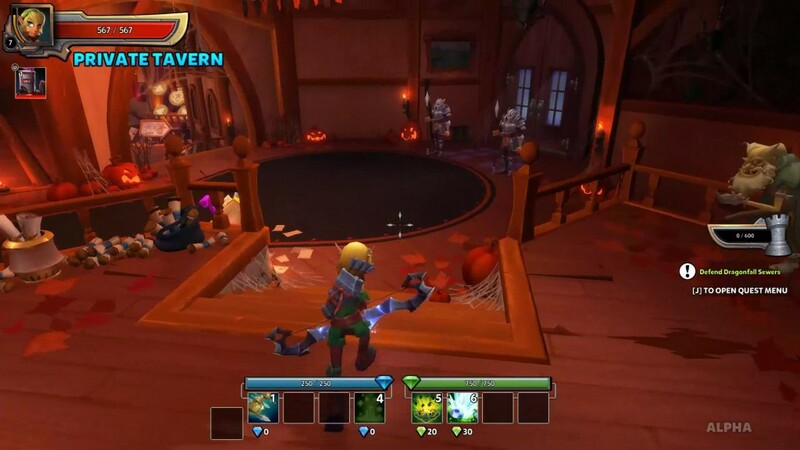 Dungeon Defenders II is an online game and you will see multiple players in the tavern. I really like how Dungeon Defenders II does not use any key binds for menus that we are used to seeing in RPGs. While this makes it a bit more troublesome to get things done, it does keep the game more immersive. In order to change your equipment, add stats to your character, and even report bugs, you must talk to some NPC found around the tavern. The default tavern on your server might be quite hectic and packed, resulting in lag (depending on your PC) and difficulty to find your friends. For this reason, players can create a private game which limits only you and your part from joining your tavern. In order to invite friends to your game, you can simply use the Invite functionality already found in Steam. Dungeon Defenders II, like the previous game in the series, is still very fun to play with a group of friends. I mostly found myself playing the first game locally with friends and was pleased to see local co-op and controller support on the game’s roadmap. I look forward to being able to play with friends in the same room again. It really is a game where good communication and teamwork is needed and the in-game chat and communication features just don’t cut it. It is rare to find a group of random teammates that can work together as well as your group of friends. With the game being free to play, I could definitely see myself playing this game from time to time with a group of friends. I do not foresee myself ever playing this game solo in the future, but do not let that stop you from trying it for yourself. 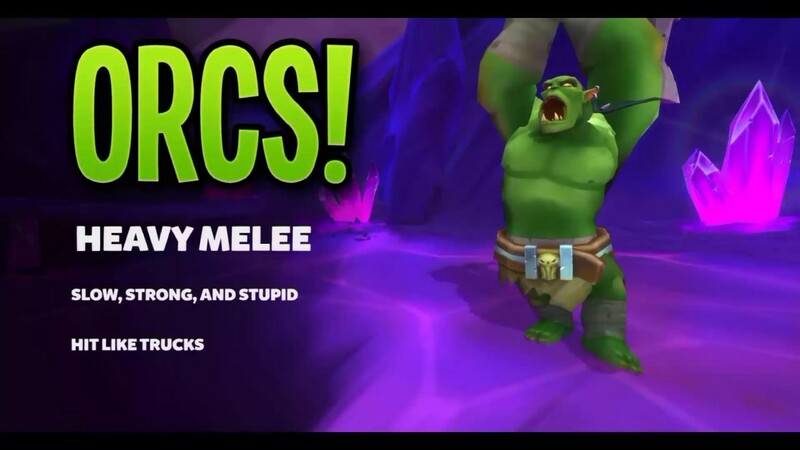 I know a lot of people that have enjoyed the Dungeon Defenders series solo or with random teammates. I’m looking forward to seeing what is in store for Dungeon Defenders II upon release. Go ahead and try out the game on Steam, it’s free! City State Entertainment has revealed both the game's basic stat system and their magic system.